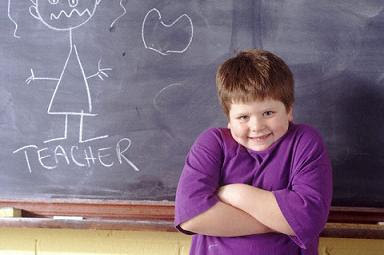 British teachers think they can tell which pupils are likely to play up by looking at their names, a survey suggests. The poll of 3,000 teachers found more than one in three expected pupils with certain names to be more disruptive. Pupils called Callum, Connor, Jack, Chelsea, Courtney and Chardonnay were among some of the ones to watch. The online survey by parenting club Bounty.com found 49% of UK teachers made assumptions about a child when they first looked down the register. But it is not all bad news, with 57% of the teachers surveyed saying the naughtier children tended to be more popular than their better behaved peers. More than a third said the naughtiest pupils were often the brightest and the more sensitive. Many teachers (69%) said they had difficulty pronouncing some of the more obscure names chosen by parents. And 71% of teachers admitted to have a private chuckle over some of the more unusual names. The survey also asked teachers what the brightest children tended to be called, with Alexander, Adam, Christopher, Benjamin, Edward, Elizabeth, Charlotte, Emma, Hannah and Rebecca coming in as the brainiest names. Names of the most popular children in the class included Jack, Daniel, Charlie, Callum, Emma, Charlotte, Hannah and Anna. Faye Mingo from Bounty.com said: “Teachers are only human and make assumptions like the rest of us. “Rightly or wrongly, most of us make assumptions based on something as simple as a person’s name and we base these on our previous experiences.